Contact us for new and reconditioned alignment instrumentation and racks. McGee company has a full line of HUNTER alignment products anything from Camera Alignment systems to Optical Alignment systems. We have factory trained representatives that can answer all your equipment needs. Since 1951 McGee Company has provided alignment equipment and Specialty Product alignment adjustment parts. In its most basic form, a wheel alignment consists of adjusting the angles of the wheels so that they are perpendicular to the ground and parallel to each other. The purpose of these adjustments is maximum tire life and a vehicle that tracks straight and true when driving along a straight and level road. 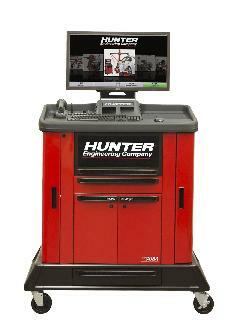 McGee company can provide you with multiple solutions from our large inventory of HUNTER alignment equipment. Our goal is to provide your shop with more profitability and supreme customer service. Check out our tire changers, balancers, and brake lathes.